Preheat oven to 425 degrees F. Line a baking sheet with two layers of parchment paper. In a large bowl, add in the flour, baking powder and salt. Whisk and set aside. In a heavy bottomed pan, pour in the milk, sugar and butter. Warm on the stove until butter is melted. Take off the milk from the stove and add in the flour; mix with a spatula until lump free. Place the mixture over the stove again and cook on low heat, stirring continuously for 30 seconds – one minute until it forms a ball. Set aside. In a medium bowl, pour in the water and add in egg replacer powder and whisk well. Add in the dough to the mixture and mix until well incorporated. In between add in the vanilla extract. Take out the mixture into a piping bag and make eclairs over the prepared baking sheet. Clean out the edges with fingers dipped in water. Bake in the oven for 22 – 25 minutes. Take out eclairs from the oven and place over the cooling rack to cool completely. Meanwhile, prepare the filling – in a bowl, mix together until creamy. 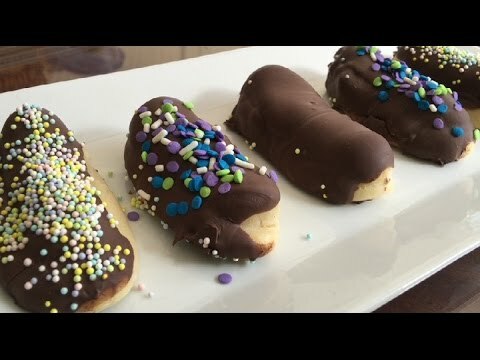 Place in a pastry bag and make holes in eclairs. Fill with the filling and set aside. In a bowl, add in the chocolate and melt in the microwave. Add in the oil if required to smooth the chocolate. Glaze the eclairs and top with sprinkles / nuts or coconut. Serve the eclairs with tea or coffee. Homemade Thin Crust Pizza Video Recipe by Bhavna - Low fat!! !